Ah, it's good to take a few Dazes away from Thy Keyboard, Whale' at least posting Somme-thun' on Ye BLOB', what Thy late Awntie Harriet Christened I-T; nee No Fenders, after enjoying the weekend listening to the Rolex 24, which naturally made me think of the recently departed Dan Gurney..
And if Y'all have been reading this Blob Fantastica! Since the beginning 'O year, then Yuhs know I went to California and All points in-between with Tacoma Bureau Chief Mary Ellen as Thy Chauffer in the Silkmobile with Pixie-the-Wonderdog WUF-WUF! And Silk - whose car it is; Hya! As Silk, who many asked us if He's part Great Dane? And the more I talk 'bout him, I think of Marmaduke! Having likened Silk to Ah Snappin`' Turtle every time I tried eating various meals upon going thru the Drive-Thru, as he tried sticking his snout over my shoulder between the two front seats for a Wee Bitamyte 'O Cheeseburger; CRIKEYS! As I was gonna lament Y'all how WET it's been since returning home from California. And the difficulties of trying to swing thou White Cane thru the Mud, Muck and Puddles! Not to mention Winds of 25mph, along with Homeowners too DAMN lazy to sweep off their sidewalks! But our inclement weather's causing Mud flows AIN'T Nothin' compared to California's, i.e. ; specifically Montecito! As it was a GURR-REAT! Trip beginning in Fresno, then heading Northwards to Seaside via Highway 1, which brought back ancient memories of the Hystericals' as Mary Ellen called out Pebble Beach's 17 Mile Drive, Monterey, etc. After a night's stay in Seaside, it was back South to a place I'd obviously Prattled on 'N on 'N on 'bout over thou years... As Mary Ellen said, DON'T you wanna go to Big Sur? 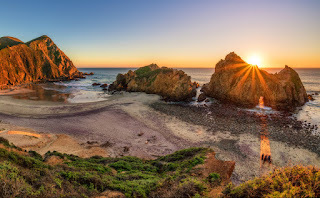 Thus she found out how to access the private road to Pfeiffer Beach and it's magnificent "Window rock," which may or may not also be known as Keyhole Rock, Arch Rock or the Keyhole Arch Rock; Cornfuzed? "In Big Sur we Take some Time to linger on..."
Reluctantly, we had to leave Big Sur before we wished too, as it was a long day's journey north again, this time crossing over the legendous' Golden Gate Bridge, naturally shrouded in fog! Then meandering over Mount Tamalpais, also shrouded in Fog, as this was the twistiest road I've ever been on! Creeping about since the main road's still washed out from a year ago - as we traversed the Stinson Beach Detour. Finally arriving at our destination late Wednesday night, the HighlandsResort, where we enjoyed excellent Hospitality and the luxurious tranquility of secluded cabins nestled in-between the Redwoods along the Russian River! Doran Regional Park in order for Mwah to walk upon thou Beach, along with taking the Hoonds' for a stroll. Then we went off in search of the Walgreen's in Santa Rosa, where Mary Ellen described the vast amounts of carnage from the Fires, noting how a whole Trailer Park community was Flattened! Along with a Gynormous pile 'O rubble in a parking lot, presumably the Costco Store that burned to the ground! From Thar it was to Willits, CA, our most Dismal stop of the journey Northwards, before getting stuck in a deluge 'O rainfall in Crescent City, our last night's stay in California. And somewhers' between The Redwoods and Crescent City, or Oregon whilst still on Highway 101, my mind began Ah-wonderin' about just where had the Carrera Panamericana ended Stateside? As I find it very Apropos or ironic that I was in California, Dan Gurney's adopted home state when he died. Although I'd be totally unawares' of this until returning home a week after his passing. For which I'll defer Y'all to a slightly different take upon this, since mine hasn't been started. Or even more Karmic since when I think of Dan Gurney, I tend to recall my lone meeting with him nearly two decades ago at Pacific Raceways, where the Star of the Show for Mwah was the ultra unique Ferrari 375MM racecar that Phil Hill and Richie Ginther co-drove in the 1954 Carrera Panamericana road race. Thus, per tipicali, Al gore's wondrous invention Zed Internetz' was being Persnickety to Mwah! When all I could find upon my initial inquiry was that the Carrera Panamericana was devised by the Mexican Government to publicize the completion of its portion of the Pan American Highway, ultimately linking Alaska, Canada and the Good 'Ol U.S. to Mexico 'N beyond. As I pondered out loud to Mary Ellen, which Highway did it connect upon? Since today's modern Automobile travel partakes Interstate I-5. Yet this replaced Highway 99, which ran north to Blaine, WA; Washington's Canadian Border, and ended south at Calexico, CA between 1926-1972. Alas, surely this was the route's endpoint on our side of thou Rio Grande, Ci? 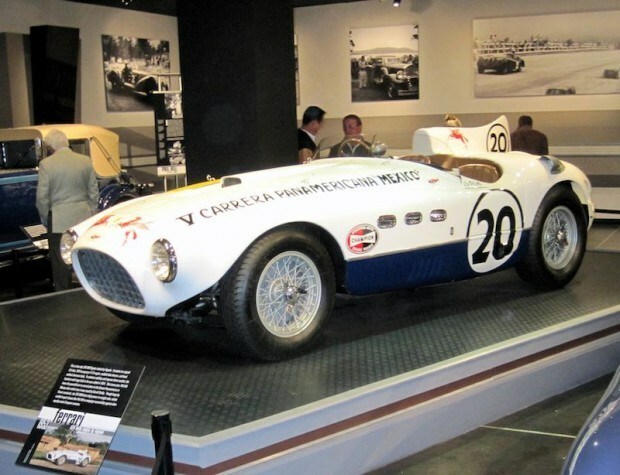 Especially since the Carrera Panamericana ran for five years between 1950-54 before being cancelled due to its extreme danger and High Death Rate! Running North to South, began at Ciudad Juárez, Chihuahua, "On the Border" of nearby El Paso, Texas, to Ciudad Cuauhtémoc, Chiapas, at the Guatemalan border. And then crossing into Oregon via Brookings, this naturally made me think of the Brookings Institute, before we made our way to thee "Other Florence" to visit our good friends, albeit just a brief Pit stop before a brief walk upon the beach and then to our night's destination Lincoln City. As we just had to stay Thar, especially since I've been to the monument on the B-I-G' Island, aka Hawaii to Captain Cook's Obelisk monument. As we stayed at the Captain Cook Inn. As the room was slightly funky, but I enjoyed it's unique charm replete with wicker furniture which made me think of Hawaii. Then after getting my wish to trek down the trail to Smuggler's Cove at Oswald West, albeit in Gale Force Winds R' Matey! We made it back to the car Justin-time' before the skies opened up! As the rain just increased the rest of the way home, including driving over the Astoria bridge,. Although not bothering to stop at Fort Astoria, for which I've got an infinity for due to its mystical connection to the Astor Cup, for which I've prattled on 'bout before. Whilst upon returning home a Fortnight later, after some approximately 1,800 miles by car and telling Mary Ellen I felt tired, to which she replied, you should be exhausted! Becoming totally engrossed in an overly long, but fascinating Vanity Fair article about a young German man named Oskar Speck, who ultimately paddled 30,000 miles over seven years from the Danube River in Germany to Australia!